There is so much about Bar Harbor that I just loved during our week there. Acadia has so much to offer and kept us busy hiking, biking and exploring all week. Our first day we got a sense of where we were when we hiked from our house to the top of Cadillac Mountain. I'm still not quite sure how we found our way over the top of two smaller mountains (Kebo and Dorr) before we found the correct trail to summit Cadillac. But we did it. And despite the challenging rock ledges we had to navigate, it was a beautiful hike and well worth the spectacular view at the end. While Acadia is a must when you visit Mount Desert Island, the town of Bar Harbor is also teeming with plenty of things to do and see. Our cottage was right in the center of town. Perfect location. We arrived around eight on Saturday, after a 14+ hour drive from DC, and ended up at McKay's Public House for dinner. The restaurant is in an old, historic Victorian and has a darling patio that is surrounded by greenery and string lights. We sat outside the first night, but insisted on going back later in the week to sit inside and take in the quaint atmosphere. The service was wonderful and the food was great. It's a nice place to just sit and unwind. On Sunday morning, Tim and I ran down to the Eden Farmer's Market. We bought some produce and coffee, saw an adorable baby goat and ran into some friends from DC. We tried to cook a lot at the house, but also made an effort to eat as much lobster as possible. There is lobster pretty much everywhere in Bar Harbor, so it was hard to decide where to go. We found that we loved the lobster rolls at West Street Cafe, where we had lunch before heading off on a 14-mile bike ride through Acadia. It was a strenuous ride along the carriage trails, but the scenery kept us going. As did the consensus to to stop at the Bar Harbor Brewing Co. tasting room after the ride. The brewery is right in town and for a few dollars you can try all their seasonals. Almost every morning, we made an effort to either run or walk along the Shore Path. The path winds along the rocky cliffs around town and the views are just gorgeous. 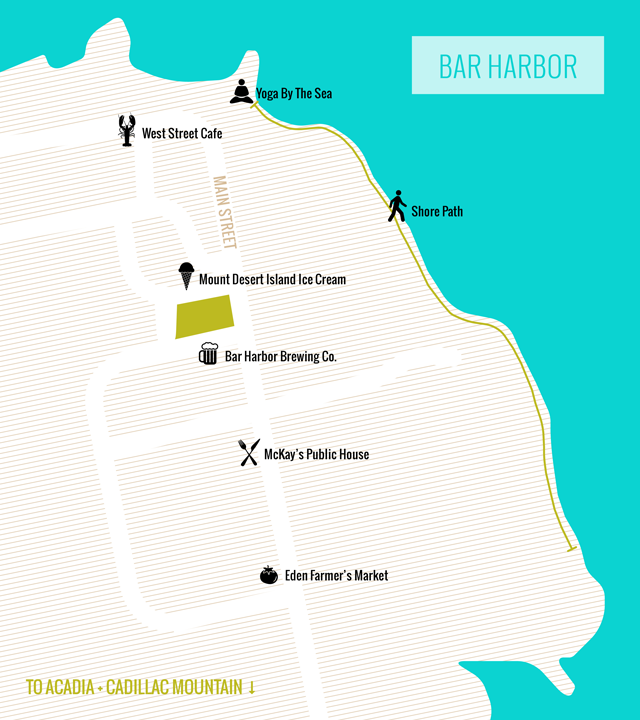 At the north end of the path is the Bar Habor Inn, where Yoga by the Sea classes are offered daily. I went to a couple of classes throughout the week and really enjoyed them. The classes are small so the instructor is able to tailor the classes to her participants. And the harbor view makes them really worthwhile. In addition to finding good beer, Tim was on a quest all week to find the best ice cream in town (there are many places to choose from). And we found it: Mount Desert Island Ice Cream. It was pretty amazing. The flavors were all homemade and unique and the owners also run a coffee shop two doors down, which was equally affable and delicious. Though not our typical summer beach trip, I enjoyed experiencing someplace new. Maine really made me miss New England. We don't get up there as often as we used to, which will hopefully change after this trip. One other thing I want to note, I decided to do a map graphic as part of this post because I recently discovered The Noun Project. It is a place for graphic designers to share and download all sorts of icons. Make sure you check it out here. For more photos of the trip, follow me on Instagram here. Icons courtesy of The Noun Project.